MAPSOno is the family name of our anthroponomy processing package; a set of specialized modules tuned for applications such as information retrieval, document clustering, named entity extraction (NER), and translation. Output samples are available for download as PDF for your convenience, you are also invited to send us your sample input for processing free of charge, we accept limited size samples in any form or encoding. Romanization is a way of reproducing the sound of the words according to the orthography rules of the target language "mainly Latin script based language"; uniform results in the Romanization of non-Latin based script languages are difficult to obtain, since vowel points and diacritical marks -if any- are generally omitted from both manual and machine writing. It follows that for correct identification of the words which appear in any particular name, knowledge of its standard Arabic-script spelling including proper pointing, and recognition of dialectal and idiosyncratic deviations are essential. 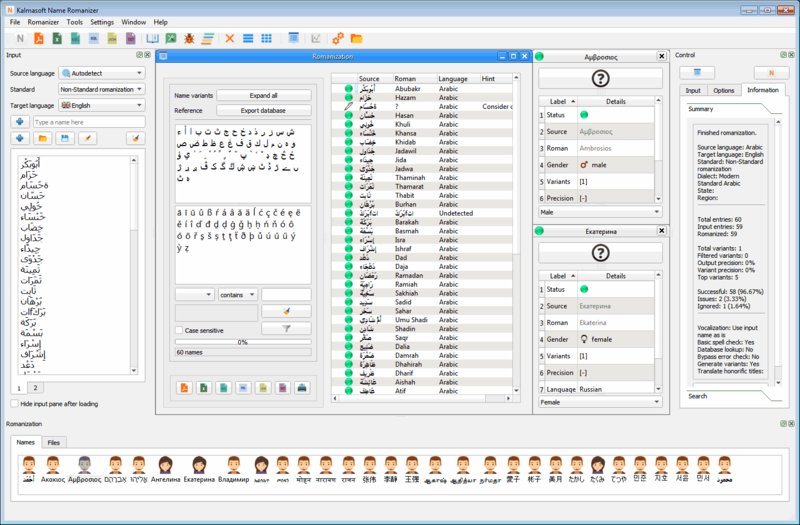 In multilingual applications, the problem of corss-lingual name matching is complicated by the fact that when a name is represented in a script different from its native script there may be several alternative representations for each phoneme, leading to large number of potential variants, this is true for Romanized forms of names in many languages such as Arabic. Romanizer does an orthographic transcription by default, a process that can distinguish between multicultural names and apply a sophisticated algorithm to provide the most likely variations. It is neither a simple name matching algorithm nor a name combination generator engine; it rather goes all the way back creating a new legitimate version of the input name token to decide which legitimate variants to return, thus avoiding the elaborate listing of trivial and never-exist variants mostly output by simple combination processes. It also tracks cultural variations through look-up database of refined set of etymologic database to follow exactly the way used by specific culture to Romanize the name. Arabic personal name has no more than one way to spell and this is true for most of the names exist in the language vocabulary; variants occur only when romanizing the Arabic name to other languages that have no one-to-one phonetic relationship with Arabic e.g. all romance languages. As a result of this each Arabic name has many romanized variants in other languages too. "Ahmad" and "Muhamad" in Gulf region e.g. KSA, Iraq, Oman, etc. A screenshot of the MAPSOno Romanizer interface, you can view the technical specifications. You may also DOWNLOAD Evaluation copy.